The Citroen DS is one of the classic French cars. In production for 20 years (from 1955 through 1975) it was offered in a variety of submodels and body styles. The DS 21 was introduced for the 1965 model year and featured a few improvements over the original DS 19 models, namely it offered electronic fuel injection – one of the first mass market cars to do so. The DS 21 also had a larger engine: a 2.2-liter straight-four making 109 horsepower. It would later be one-upped in 1973 by the 141 horsepower DS 23. The DS is also famous for its hydropneumatic suspension: there aren’t springs at each wheel but rather, a hydraulic accumulator. The effect was akin to floating down the road. For extra weirdness, the DS came with a single spoke steering wheel. Why not? Most DS models were sedans, but Citroen did offer a factory convertible (or “Cabriolet d’Usine”) which was actually bodied by Henri Chapron. It was only sold between 1958 through 1973 and in very limited numbers – just 1,365 factory convertibles were built. and this is one of only 95 built in 1968. Chapron bodied some other DS convertibles outside of these “factory” cars and they are even more expensive. The consignor has owned this car since 2000 and it was restored since that acquisition. 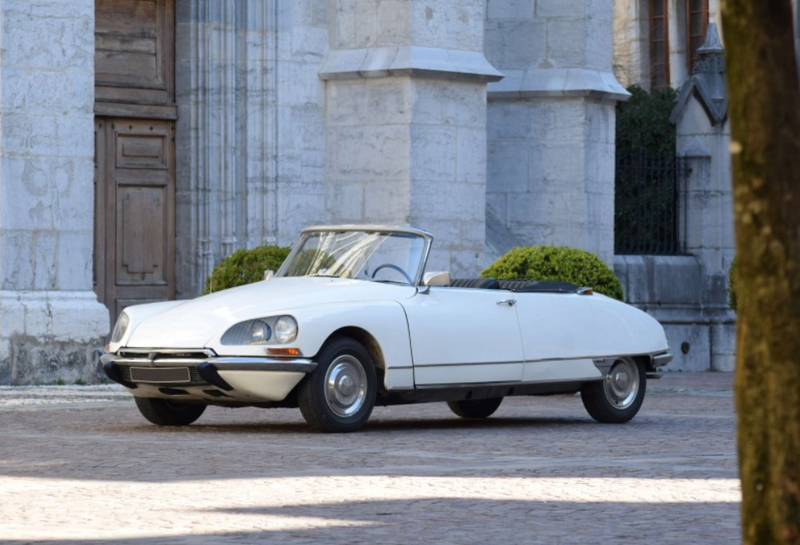 DS Cabriolets are some of the most common-looking big money French cars out there. This one is estimated to bring between $160,000-$250,000. Click here for more info and here for more from this sale.